The room is small. Its white walls are smudged with smoke, dried stew, and fingermarks. A white mosquito net hangs from the ceiling, falling to the sides of the bed. There is a stove at a corner with some plates and cutlery sitting beside it. At one end of the room, a small window opens up to a view of an almond tree in the compound. Every morning, Sanni Garuba wakes in this room to the ticking of the clock and the sound of breathing from his roommate. Slipping out of bed, he steps outside and lays his prayer mat under the tree. He commits his plans to God with his knees bent and face turned to the east. Then he sets out for the day. I have known Sanni for about nine years. He once worked as my family security man, going about his activities with a demeanour peculiar to those who are content with their lives: gentle strides, soft voice, tender smile. One evening, about five years after Sanni stopped working with us, I sit with him as he talks about his experience living in Lagos. In Argungu, Sanni’s hometown in Kebbi state in northwest Nigeria, the major means of livelihood for the three million inhabitants is agriculture. In Lagos, however, many northern migrants work as guards—usually known as gatemen—in several houses. These gatemen often own kiosks to supplement their income, where they sell sweets, handkerchiefs, tissue paper, soaps and baba dudu—a cheap parody of chocolate. Sanni did not have a kiosk, depending solely on his salary from attending to our gate. In 2015, with the looming economic recession, he used his savings to buy a motorbike to start transport business, one he thought would be lucrative and afford him a little freedom. As our gateman, he could not travel as he wished. Now self-employed, he could go home frequently to spend time with his family. When he first arrived in Lagos over twenty years ago, he worked as a cobbler, fixing shoe buckles and bonding soles, often getting paid by a barrage of insults as opposed to the money. Initially, what infuriated him wasn’t that he was cheated, but that “Aboki,” a word used in his hometown to refer to a friend or a person to whom one is endeared, had become a label synonymous to stupid. The perpetrator moved on, oblivious of the distress he had caused. Sanni holds up his right palm, shaking his head in disgust as he recounts those moments from years ago, even worse that the derision has continued till now, as a large number of southerners still use the word in derogatory manner. When Sanni wasn’t called stupid, there were times he was robbed by miscreants as the security in the city was in a pitiful state. However, things took a new turn when Mohammed Buba Marwa became the governor of Lagos state. The governor was respected for many things, including setting up “Operation Sweep,” a joint police and military effort that fought crime, and reduced it drastically during his administration. Sanni’s best friends also make money from Okada business: Idris, with whom he has shared a close relationship since they were in primary school back in their hometown. He met Jonathan, an Igbo man, five years ago before he ventured into Okada business. The three of them often catch up on their activities while awaiting customers at a bus stop in Okota area where they live. On some nights, they encounter drunken people who appear sober when they are flagging down an Okada, only to start snoring a minute or two into the trip, their heads resting on the rider’s back. With one hand on the throttle grip of the bike and the other holding the inebriated from falling, Sanni and his friends manage to take them to their destination in one piece. Far from where they regard as home, here they are, sharing random and notable moments, together. Sanni’s friendships have provided him support. Once, a car hit his cousin when he came to visit him in Lagos. He was taken to the hospital and Idris was there with him. His cousin died shortly after the accident. Sanni closes his eyes and slowly shakes his head as he recalls the events of that day. We sit in silence as his memory hovers above us. When Sanni’s wife gave birth to their first child, he had no money to take care of the mother and baby. Idris came through for him. Now 47, Sanni is the father of four kids—the first child, a girl in secondary school, dreams of becoming a medical doctor. Does it matter, I ask him, that his first child is not male? No, he answers, they are all children, regardless of their gender. It would not have made any difference if he did not have a male child at all. Before Sanni arrived in Lagos, he worked in Kwara and Niger states, tilling land and planting crops for whoever needed his services, putting good the experiences he acquired when he owned a farm in Argungu. He had financial trouble at some point and could no longer sustain the farm. Now, in Lagos, he is most concerned about saving enough money from his motorbike business and then going back home to continue planting beans and rice and millet. Mohammed, Sanni’s uncle, also shares a similar plan. Mohammed, a tall, dark man in his late sixties, works as a gateman in Lagos. Sanni had introduced me to him a few days earlier and the three of us had agreed to meet. Now, awaiting Sanni to join us, I sit across from Mohammed. He tells me he has two wives and eight children back home in Kebbi State. And that is as far as we can go as his knowledge of pidgin English is quite sparse, and my spoken pidgin is poor. Although I carefully knit the words so they are coherent, it makes little difference. “Ehn… Since morning,” he answers. He laughs and shakes his head. I smile, and silence slowly fills the space between us. He must be new in Lagos, I conclude. My brief exchange with Mohammed brings to mind a time I needed the service of a shoemaker a few year back. I called him and began trying to speak in pidgin. “Ah, kò gb’édè,” said my mother, which meant that making gestures with my hands was enough and not to bother talking since he would not understand. I have often looked back at that moment and my mother’s words. Kò gb’édè. He does not understand language. Which language counts? In some primary schools in Lagos, every other language besides English is considered vernacular, and speaking it is a punishable offense. After a brief moment of silence, Sanni wheels his motorbike in through the gate, wearing a sky-blue buba, black trousers, and a smile. Sanni tells me Mohammed first came to Lagos when Shehu Shagari was the president of Nigeria and was here when Mohammed Buhari overthrew the president in the 1983 coup. This estimates his stay in Lagos to about thirty-six years, working as a gateman in different houses. Taken aback by this information, how, I wonder, has he been able to communicate in a city filled with millions who do not speak the Hausa language? I imagine Mohammed at home with his family, a completely different man, free and fully himself, speaking a language in which all their lives are accommodated. How do you thrive in a city that creates no room for your language? Bashiru, unlike Sanni who keeps to himself, is a bubbly young mobile tailor. His face seems to have a smile permanently stamped upon it. This twenty-one year old goes out every day, hitting a little metal rod against the sewing machine balanced on his shoulder to announce his presence in the neighbourhood. Before he moved here in 2015, he lived for two years in Ogun—the state bordering Lagos on the north and east, absorbing the city’s activities and attitude towards migration with ease. Bashiru’s great-grandparents migrated to Kebbi State from The Republic of Niger in early twentieth century. His family has since been living there, a state in which Bashiru was born and now claims. Dominant among the inhabitants of Kebbi are the Hausas, Fulanis, Kambaris, Kabawas, Dakarkaris, amongst others, including those who migrated from The Republic of Niger. Kebbi state is bordered by Sokoto State, Niger State, Zamfara State, the Republic of Niger and the Republic of Benin. Being a landlocked country, the Republic of Niger has many of its citizens now residing in neighbouring countries. Dandi, being the border town between Kebbi and the Republic of Niger, has a high population of Nigeriens dwelling there. Apart from the shared border, Nigeria and Niger have cultural, social, and historical interactions. Over the years, the citizens of the two countries have travelled and traded along the borders. Marriage is common between Nigeriens and northern Nigerians. In Kebbi, the politics of assimilation of non-indigenes appears to be fluid. Bashiru is no longer bothered about those who regard him with contempt in Lagos, unlike when he first arrived. He is more concerned about doing his work, getting paid and enjoying his life. Every year, after the Ramadan fast, thousands who have been away from home for different reasons—work, education, duties—return to their loved ones to celebrate. Bashiru remains in Lagos, attending parties organized by wealthy Muslims. He is a regular attendee, not just for the food, which is always in abundance, but also for the women. He talks with enthusiasm about past parties and the ones to come. It is a space where language is not a barrier, where they need not stutter or struggle to piece together words that are not theirs in order to make their intentions known. At these parties, it’s their music, their dance, their food, their women, their men, their laughter, their energy, their community, their space. Sanni does not observe the Ramadan fast. A few years ago, he was diagnosed with ulcer. Now he only partakes in the prayers. When he does not travel home to spend time with his family, he buys food for a Muslim fellow in Lagos who cannot afford a good meal to break their fast. But he could not do that during the last Ramadan because his financial state would not let him. Northerners in Okota used to have an organization, a space where they met, exchanged confidences of various kinds. They donated money to cater for members in need. They also discussed issues that affected their jobs, like excessive daily taxation from the National Union of Road and Transport Workers, leaving them with only a small fraction of their hard-earned income. However, lack of transparency by the leaders of the organization began to arouse suspicion within the group. They would later uncover their deeds: they had been stealing money meant for the association. Everything fell apart. Sanni is impressed by the spirit of hustling that seems inherent in Lagos residents. It motivates him to see everyone striving in their own way to make their dreams come true. His biggest regret is not getting a western education because his parents could not afford it. There are things he would have loved to do. Knowing that he could be leading a completely different life if he had had some privileges, Sanni is involved in the education of his children as a matter of urgency. A large percentage of children in Northern Nigeria, especially girls, do not go to school, their lives circumscribed by early marriage. Sanni says he will do everything in his capacity to make his children succeed in life. For now, Sanni shares this small room with his roommate. He goes to work every day, where he encounters all manner of people—inebriated, kind, rude, bigots. He hopes to go back to Argungu where he will continue his farming business, planting beans, and rice, and millet. Image by Ladan Osman, from the Transitions issue. Kemi Falodun is a Nigerian writer living in Lagos. 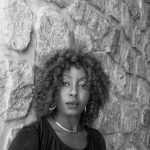 She's an Assistant Editor for Saraba Magazine and an Ebedi Writers Residency fellow. A Life in Transit, her essay chapbook on Invisible Borders trans-Nigerian Road Trip, was recently published.